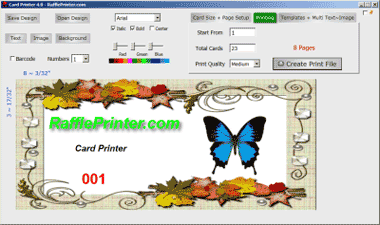 The 'Pre-Sets' Drop-down has many pre-set Card sizes, for Business Cards, Badges, ID Cards etc. You can also choose to divide the current page and orientation setting into squares in rows of 2, 3 and 4 across. Depending on paper size and page orientation, the selected size will be divided on the page to fit, by altering the Margin Settings. Try swapping between Portrait and Landscape to see if you can fit more cards on a page. Often the margins are smaller with a particular paper orientation, using more of the page and fitting more cards. As you select different Pre-Sets, the page Layout graphic will show how the page is divided (Portrait or Landscape) to fit the Cards. You can see the margin sizes and how optimally the layout fits the page. There are also Pre-Sets that will pre-fill stub text and position Numbers etc for Raffle Tickets. 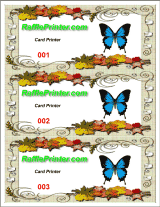 For a specialized Raffle Ticket Printing Program, try RafflePrinter. RafflePrinter prints 4 Tickets per page and assembles pages from the printer in correct sequence for stapling, perforating and cutting into books with covers. If you need more control over raffle ticket sizes, paper size, page orientation etc, you can use CardPrinter to design and print your tickets. When you select the 'Raffle Ticket (Current Size)' option, a pre-filled stub is inserted into left side of the currently selected card size, and consecutive numbers are added to stub and ticket body. It's easy to rotate the stub, re-size, edit and move it to suit. You can right click the stub text for options to rotate to 90°, roll your mouse-wheel to re-size, drag it to the right side of the ticket, or place it where ever you like.